Paul Mann Custom Boats new 63′ Sportfish. Construction is now underway. MANNS HARBOR, NC: Construction is now underway at the Paul Mann Custom Boats facility in Manns Harbor, NC, on Hull 140, an exciting new three-stateroom, two-head 63-foot Sportfish yacht. Paul Mann Custom Boats is celebrating its 30th year in boatbuilding with the beginning of this new yacht. This handsome boat will soon be a beautiful sight in the Gulf of Mexico and in sportfishing destinations and resorts around the world. Her home port will be Sarasota, FL. engines, gyro stabilizers, a 1700+-gallon fuel capacity, plus a 300-400-gallon freshwater system. She’ll also sport a full galley and a roomy salon with all the comforts of a luxury home. Much of the interior detail is still to be determined by the owners, as well as Paul and his engineering team, but teak accents will be on the exterior areas and cherry for joinery. Mann’s multiple-award winning craftsmanship is recognized throughout the marine and woodworking industries. Over its 30 years, the Paul Mann company has evolved from building functional, seakindly, and great running boats for the North Carolina coast to becoming a true custom boatbuilding industry leader, creating magnificent fishing yachts that are home-away-from-home anywhere in the world. Every single build provides owners with superior performance. 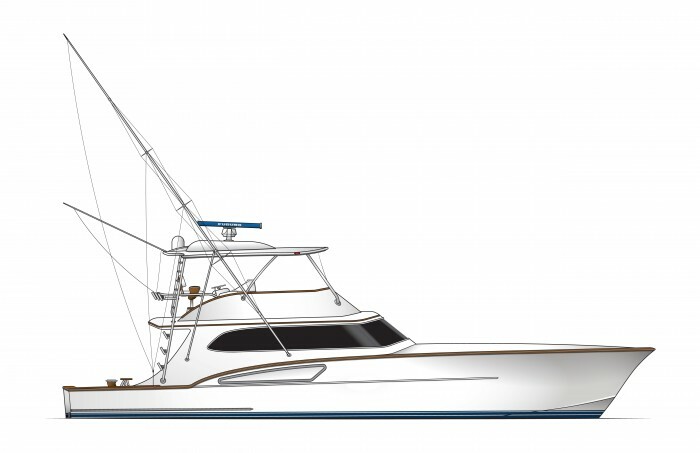 Exciting new three-stateroom, two-head 63′ Sportfish yacht is now under construction at Paul Mann Custom Boats in Manns Harbor, NC.